MBDyn has been developed to serve as an analysis tool for rotorcraft research. It has been used in the past, and is currently used, in a number of research projects, partly funded by the "Dipartimento di Ingegneria Aerospaziale" of the University "Politecnico di Milano" and partly funded by the industry and the national and European Institutions. Research performed by independent institutions, where MBDyn plays an important role, is also listed. All information presented in this page has been collected from publicly available sources. Are you using MBDyn for a research or an industrial project? Would you like to share your experience with other users? Send us a link to a webpage describing your work, and a brief description to appear in this list. MBDyn is being interfaced to TURNS, a compressible URANS solver developed by Jay Sitaraman, University of Wyoming. Graphical User Interface for MBDyn based on blender. MBDyn is being interfaced to EDGE, a compressible URANS solver developed by FOI (Swedish Defense Research Agency). This package motivation is to turn MBDyn into a multibody dynamics library for Python, so then the user communicates with objects during the whole simulation. The Italian Ministry of Foreign Affairs: Con il contributo del Ministero degli Affari Esteri, Direzione Generale per la Promozione del Sistema Paese. MBDyn is used to model the seismic support of the LIGO experiment. 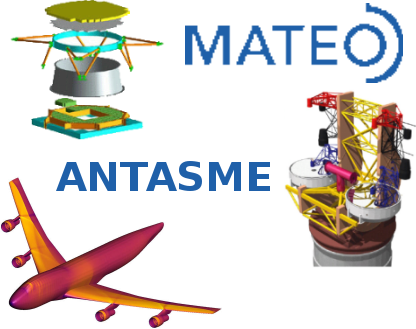 A MATEO (Matching Technologies and Opportunities) project. ANTASME uses MBDyn to simulate the deployment of deformable satellites. MBDyn is being extended to use CppAD for automatic differentiation of Jacobian matrix contributions. Distributed real-time simulation of multibody systems at DIAPM. [2000-2002] Effetti sulla stabilità a "whirl flutter" delle configurazioni di mozzo "gimbal"
If you think there is an error in any of the above reported links, or if you have suggestions about info that should be present in this list, please contact mbdyn@aero.polimi.it.